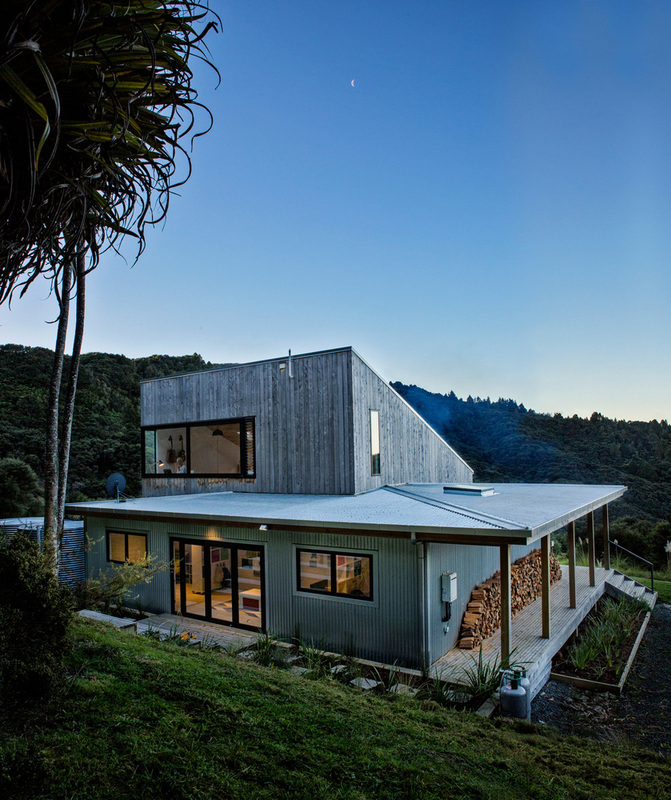 LTD Architectural Design Studio have designed a small and modern house in Puhoi, about 50 km north of Auckland, New Zealand. 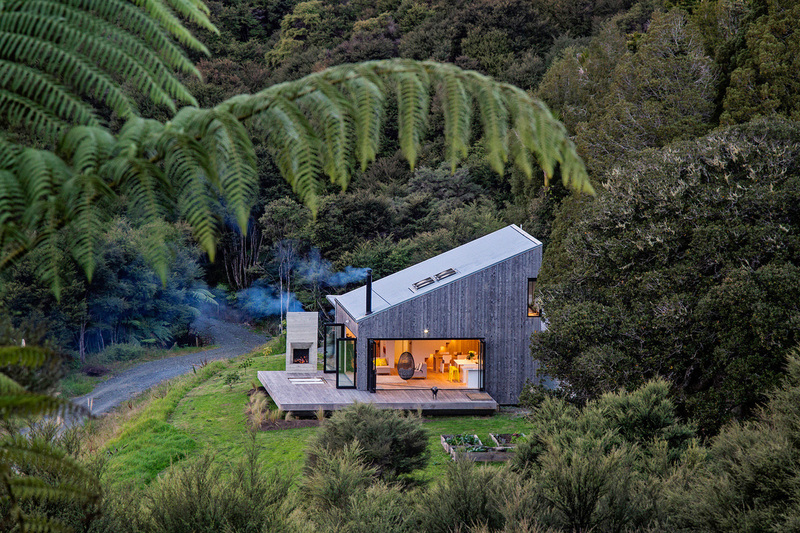 Surrounded by bush, the design of the house was inspired by the back country huts and the simplicity of their design. 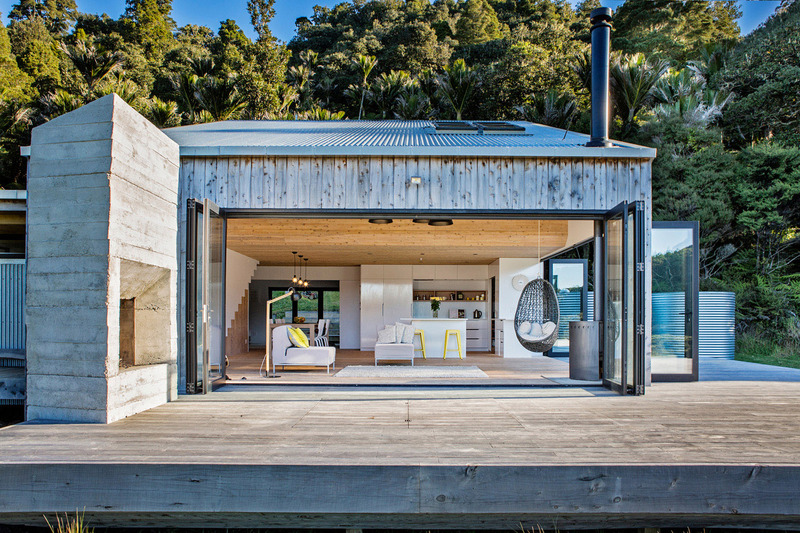 Locally sourced band sawn macrocarpa and galvanized corrugated iron have been used for the exterior materials. 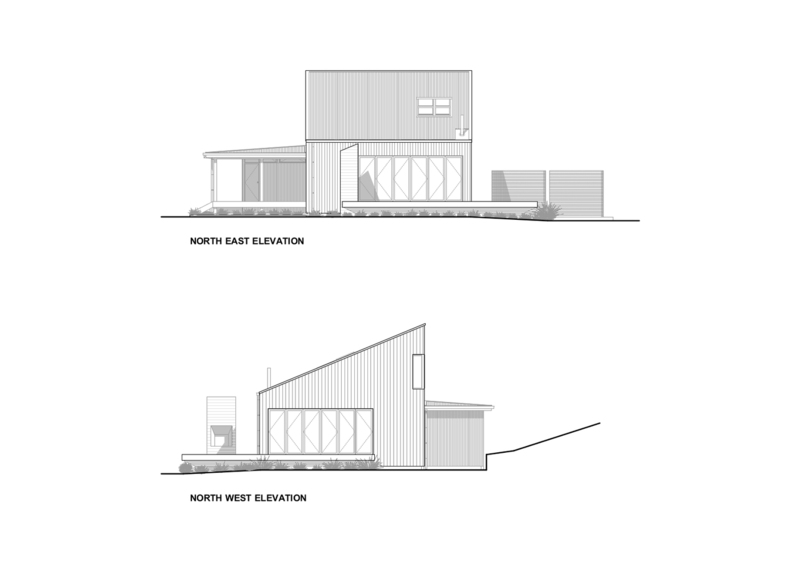 At the front of the house, there’s a deck with a board-formed concrete fireplace and sunken bathtubs, that overlooks the valley. When not in use, the sunken bathtubs have a cover that hides them from sight. This cover can also be propped up and used as an outdoor dining table, with people sitting directly on the deck with cushions and their feet in the empty tubs. Just off the deck is the living room that opens on two sides. 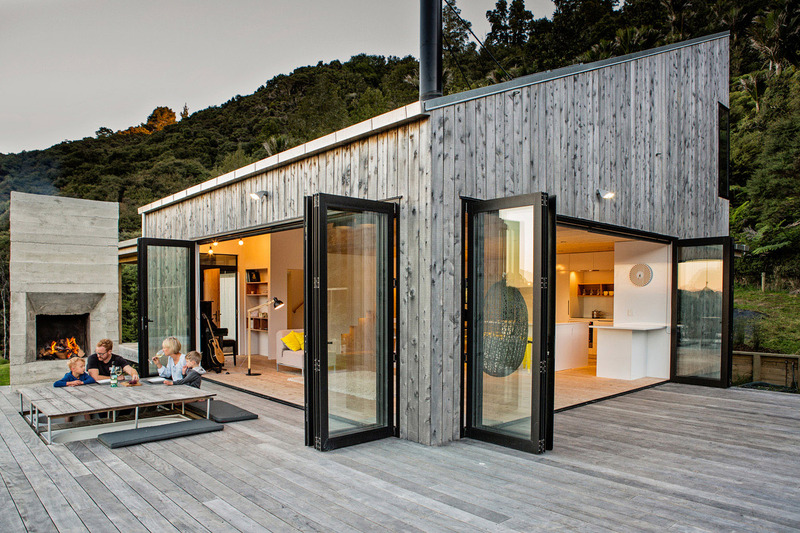 This allows the family to have an indoor / outdoor living experience. Behind the living room is the kitchen and dining room. 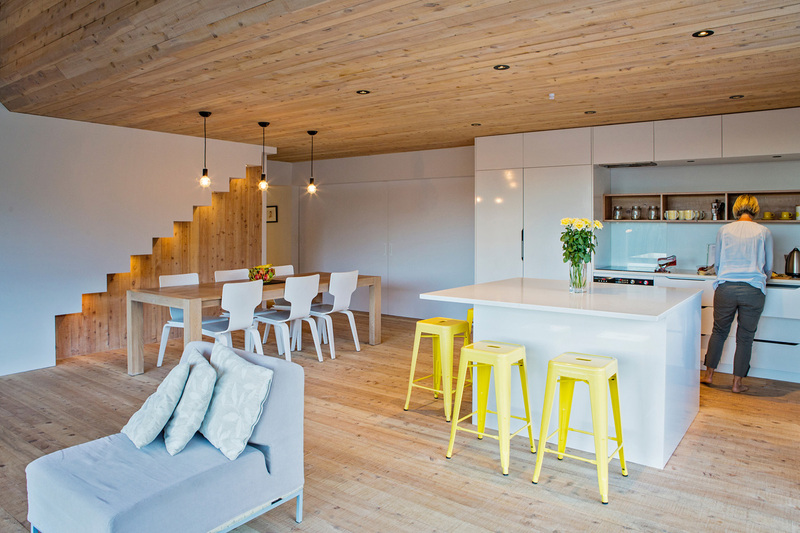 Minimalist white kitchen cabinets and dining chairs compliment the white walls. 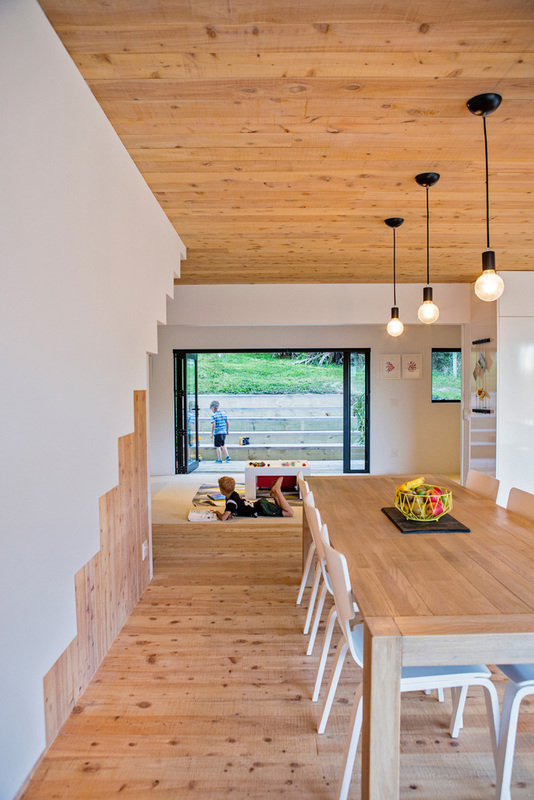 Next to the dining room is a sliding wall that opens to reveal the children’s open plan shared bedroom and play area, as well as access to another outdoor space. 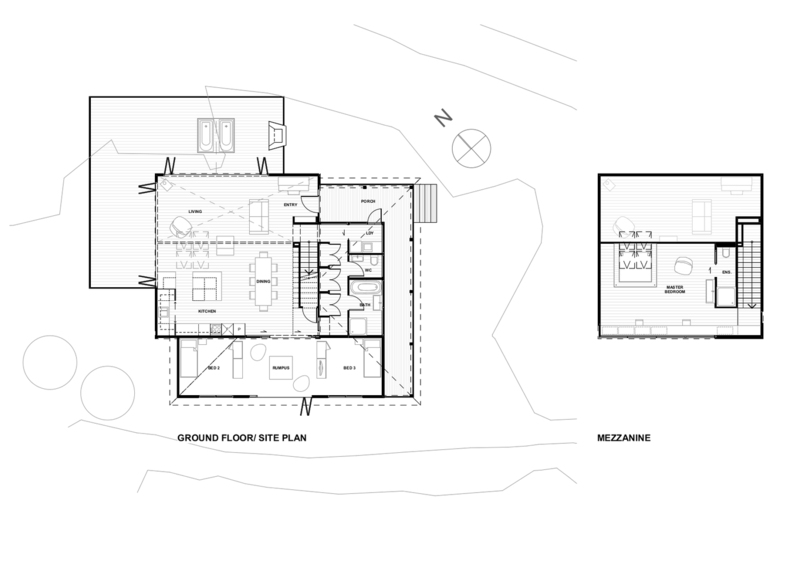 The main bathroom for the house is located between the dining room and children’s bedroom. 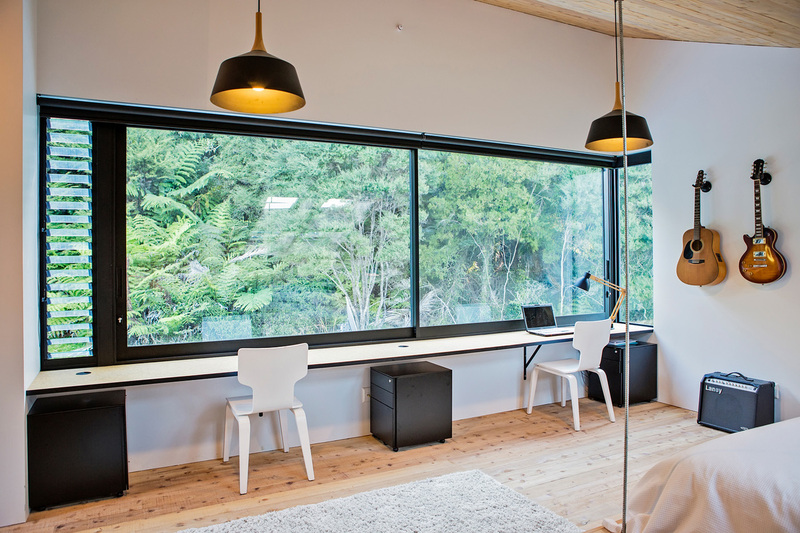 A simple color palette of wood and white has been used with a skylight adding natural light during the daytime. 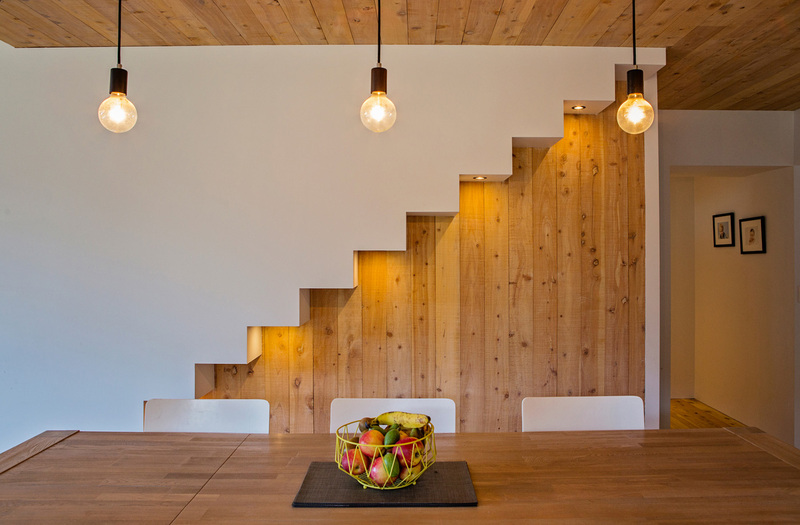 Beside the dining table is an outline of the stairs that feature hidden lighting that highlights the design of the stairs. 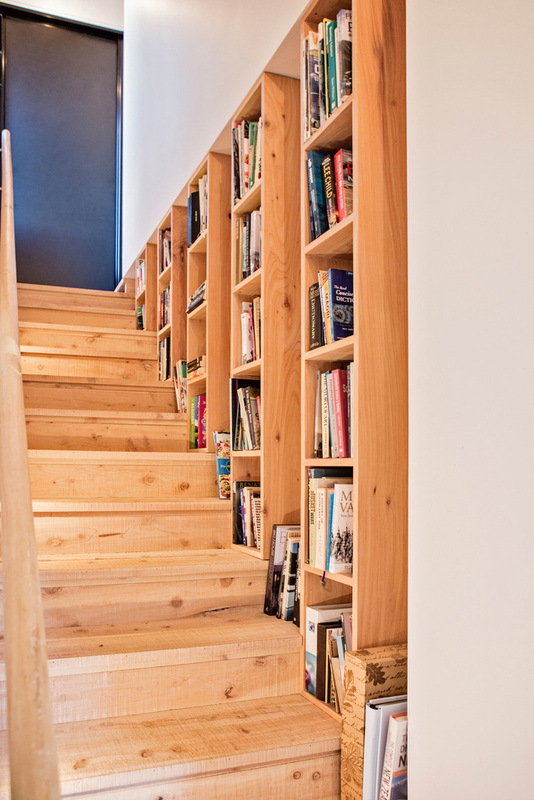 Wood bookshelves run alongside the stairs that lead up to the mezzanine. 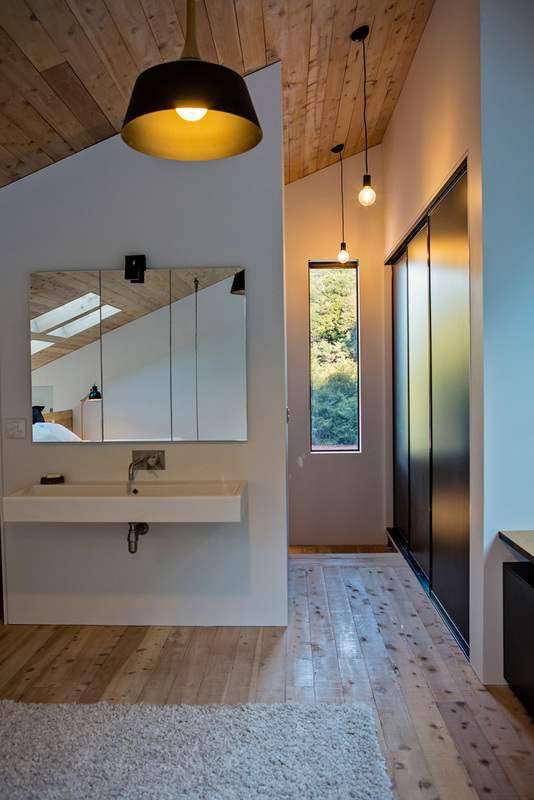 At the top of the stairs is a built-in closet and a small vanity area. The mezzanine is home to a bedroom. 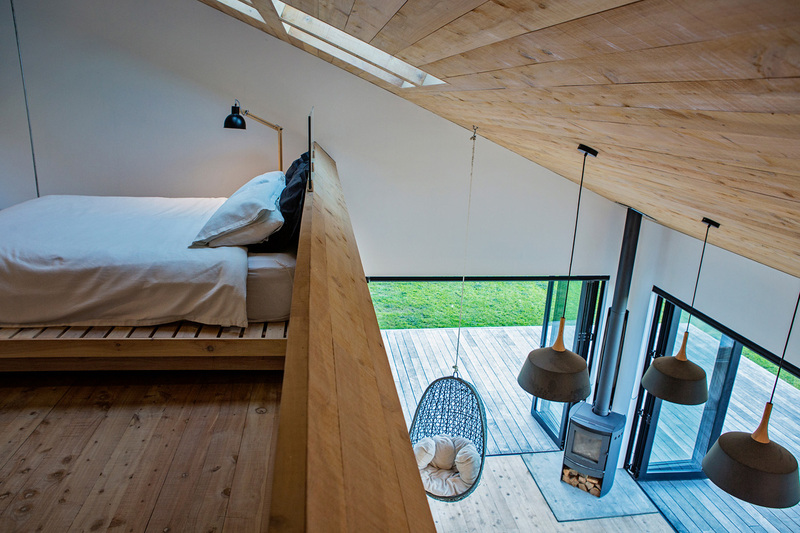 Four skylights are positioned above the bed, which is partially suspended from the sloped ceiling. From behind the bed you can see the living room below. 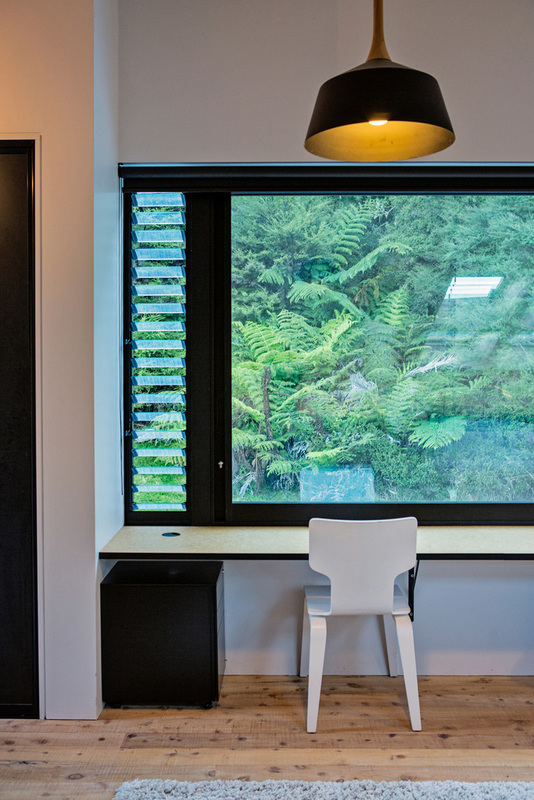 Opposite the bed is a simple two-person desk positioned beneath large black-framed windows to take advantage of the view. And don’t forget to check our post about the most beautiful wooden houses.